Delivery time varies by size, select your size for shipping estimates. Order now and your package will ship on Wednesday, April 24. Order now and your package will ship on Monday, May 6. The ring you've selected is exceptional and deserves special attention. Please phone a diamond and jewellery expert and they will help you complete your perfect ring. Don't Worry - the delay is temporary and we're here to help. If you don't see your ring size, please call 1-888-565-7609. We may still be able to help you. The selected ring size is temporarily unavailable. Please call 1-888-565-7609 for further assistance. 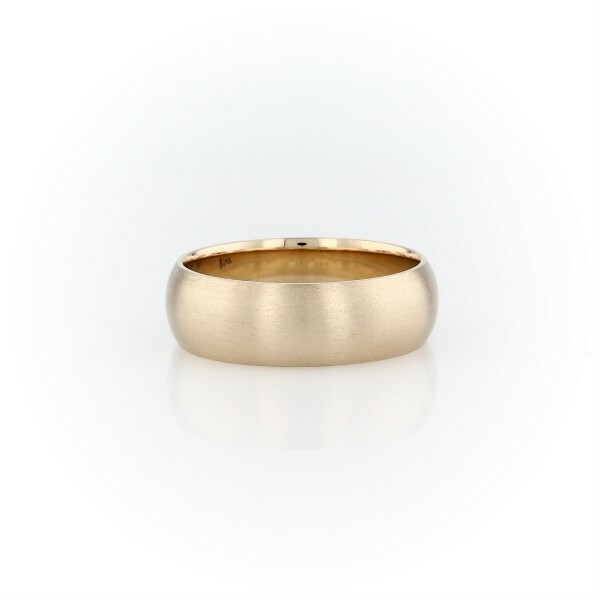 This mid-weight, matte, 14k yellow gold wedding ring has a traditional higher domed exterior profile and a curved inner edge, which makes it extra comfortable for everyday wear. AaEngraving is available in the basket for an additional cost. Men’s rings typically range from size 8 to 14. The most commonly purchased are between 8 and 10.5 and size 9 is the most popular. We are happy to exchange your ring for another size within 30 days of purchase. Blue Nile realizes that you may not know the ring size for a given finger, and we want to help. We provide a printable ring sizer that can help determine your ring size. Prior to printing, ensure that page scaling is set to "none" on your print dialog box. FREE Shipping Delivery time varies by size, select your size for shipping estimates. Note: Prices and availability are subject to change without notice. View our terms and conditions for more information.